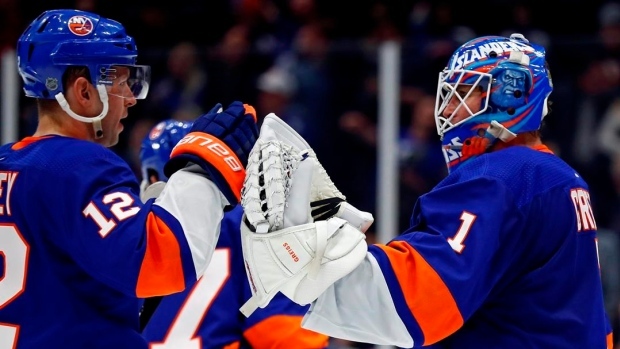 New York Islanders goaltender Thomas Greiss, Chicago Blackhawks left wing Brendan Perlini and Edmonton Oilers centre Connor McDavid are the NHL's three stars of the week. Greiss posted three wins in four games, including a shutout, as the Islanders moved back into first place in the Metropolitan Division. Perlini had five goals and two assists over three games to help the Blackhawks their overall winning streak to five games and move within five points of the final playoff spot in the Western Conference. Perlini's week included his first career hat trick in a 7-1 victory over the Arizona Coyotes on March 11. McDavid led the NHL nine points (three goals, six assists) in four games to power the Oilers to a pair of wins, reaching the 100-point milestone for a third straight season in the process.